I have lived in Los Angeles county for 33 years and starting in 2012, the wild parrots living in Southern California became regular visitors in my backyard and neighborhood. Since I am passionate about birds, I have so enjoyed photographing these beautiful parrots and thus far have photographed seven different species out of the thirteen species that live here full-time. 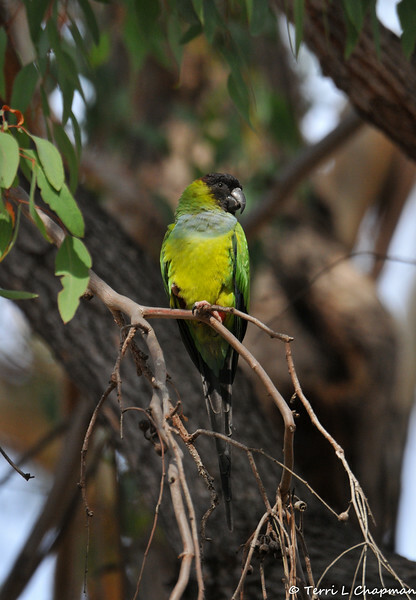 I have seen the Red-crowned Parrot the most, which in 1988 the Red-crowned Parrot was classified a Threatened Species and upgraded to an Endangered Species by 1994. Although no one knows for sure how the non-native parrots came to live in California, we know people are the reason, and these birds illustrate the capacity of humans to move wildlife around the planet for economic, social or aesthetic reasons. With the plentiful food from native and non-plants, and the mild climate, these birds are thriving in Southern California.